Offical artwork of Stalfos from Hyrule Warriors. The Stalfos (スタルフォス, Stalfos) is a recurring enemy in the The Legend of Zelda universe. Artwork of a Stalfos from Ocarina of Time. The Stalfos is an enemy that has appeared in almost every main game in The Legend of Zelda series, with the exception of Four Swords and Breath of the Wild. 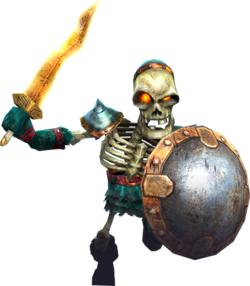 They are undead skeleton beings that wield various weapons, from swords to clubs, and occasionally wield a shield as well. In most of the games where they appear Stalfos are considered powerful enemies, and sometimes act as mini-bosses. The Smash Run version of the Stalfos is based on the design from The Legend of Zelda: Ocarina of Time, especially resembling their updated in-game model in the Nintendo 3DS remake. A Stalfos in Smash Run. Stalfos appear as enemies in Smash Run in Super Smash Bros. for Nintendo 3DS. They walk slowly from left to right, and attack when a player approaches. They actively defend themselves with their shields, which block attacks and reflect projectiles; to damage a Stalfos, it must be hit from above, below, behind, or in the brief moment in which it lowers its guard to attack. Attacking from the front is very risky, as Stalfos also possess significant flinch resistance. Stalfos attack either with a three-slash combo or a jump attack, the latter of which meteor smashes at a diagonal angle. Stalfos appear as part of the Zelda-themed waves of the generic Vs. Enemy Team final battle. A shadow Stalfos in Master Fortress. In Super Smash Bros. for Wii U, shadow versions of Stalfos appear inside Master Fortress. Unlike the Smash Run version, these shadow Stalfos can be grabbed and thrown, making them easier to defeat. The Stalfos trophy is exclusive to Super Smash Bros. for Nintendo 3DS. These powerful enemies from the Legend of Zelda series block attacks with their shields, even while they're attacking, making them very difficult to deal with. They're vulnerable to attacks from behind while defending, though, so try to hit them there while they're shielding to take them down! This page was last edited on April 6, 2019, at 11:48.